You will meet your professional guide at the port for your private half-day sightseeing. First, you will visit the Byzantine Hippodrome, along with its famous Egyptian Obelisk, Obelisk of Constantine, Serpentine column and the German Fountain. Then, you will proceed to the Blue Mosque, completed in 1616. It is a triumph of harmony, proportion and elegance. 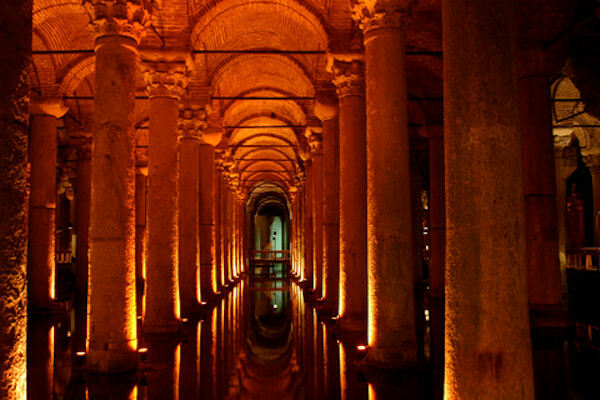 The mosque was a part of a complex which consisted of a mosque, tombs, fountains, kitchens, and a bath. Its colorful 260 windows enables the sunlight to reach inside. The blue Iznik Tiles covering the walls have given the mosque its popular name, 'Blue Mosque'. Next, you will visit one of the greatest buildings of the world: St. Sophia, the Church of the Divine Wisdom. It was built during Emperor Justinian reign (AD 537) and it remained the greatest church in Christendom until the conquest of Constantinople in 1453 by Sultan Mehmet II who ordered to convert Hagia Sophia into a Mosque. The great dome, the semidomes, the north and south tympana and the vaults of the narthex, aisles and gallery were all covered with gold mosaics, a great deal of which still survives. Last, you will continue to explore ninety-two streets of the famous Grand Bazaar. The Grand Bazaar is the largest and oldest covered Bazaar in Turkey with more than 4,000 shops. A variety of Turkish Handicrafts, Oriental carpets, rare jewels and inexpensive souvenirs all sold in small shops next to each other. The streets are named according to the trades, such as gold and silver sellers, carpet sellers, booksellers, etc. The most oriental atmosphere in Istanbul is found in the bazaar. You will then return to the ship. This tour is for 2 passengers. Don't forget your camera. This tour is for 2 passengers.